WANNA GO INSIDE ALADIN? CLICK HERE! Aladin Water & Amusement Park is spread over 52 acres of land situated on main Rashid Minhas Road and is only for families. Thousands of people visit the park daily. As you enter the amusement park you'll find unlimited means of Entertainment & Pleaseure... Beginning with Souvenir Shops, Kids Birthday PartyHalls... you find the huge Artificial Water Fall... then you reach the world of High Tech video Games Arcade... from here you hop on to the Train, which runs around the Park. A couple of added attractions are also proposed for the Amusement Park like Karachi's first public Open Air Theatre having capacity of 2000 people at a time... and a 120 feet high Roller Coaster. Futher more, you can't miss Karachi's biggest Artificial Lake which offers various boar rides... besides, there are 30 various types of amusement rides which include a 65 feet high ferris wheel etc. The water Park is yet other fun Filled area where you find all kinds of POOLS and WATER SLIDES for the Toddlers, Young and the Old..... Remember, Aladin Water & Amusement Park is where people want to be..... and then talk about it. Aladin Water & Amusement Park allows ample room for fun, Food, Frolic & Joyous Moments...And that's where your business comes in ... A FUN CENTRE right among the fun lovers called: ALADIN FUN CENTRE . After the thumping success of Aladin Water & Amusement Park, A.A Joyland proudly present ALADIN FUN CENTRE... A World Class Market place for renowned enterprises. The park in the front caters for over 500 cars & 150 Motorcycles. As you would reach the entrance of the Park, you won't miss a 120 feet high ALADIN CASTLE Building... A replica of Aladin's Theme Castle, with Seven prominent, soaring Minarets and Domes... And on either sides of this castle you'll find a row of elegant shops in formation tempting the fun lovers to attend, even before they had entered the Water & Amusement Park. The standard os shops st LADIN FUN CENTRE shall by no means be ordinary ...50% of the Fun Centre have already been committed to major international franchise for entertainment... So, select a shop or more at ALADIN FUN CENTRE from the smartly arranged shops at Lower Ground, Upper Ground and the first Floor Levels. A Well developed, properly landscaped Car park has already been developed which can cater 500 puls cars at a time. The promoters are bound to maintain all the facilities and services on common premises free of cost for 1 year after completion of the project. "A" Class permanent finish will be applied on external and internal surfaces. Marble or equivalent material will be used in circulation areas. Shops flooring will be of terrazo in water cement. Fountains and plants shall be provided in order to vitalise shopping activity indoors. Pavers of modern and different colours shall be used outdoors on parking and circulation. Plants and hard Slandscape will add to the beauty of the surroundings. All display boards shall be of a standard size and design. External & internal windows shall be of aluminum with high quality plain glass. All shops shall be provided with grill shutter of attractive design and finest quality. The centre will have adequate fire fighting equipment. Please Note that food and beverages are not allowed from outside. for groups are offered by these foods outlets. Days : Monday Thru Saturday. 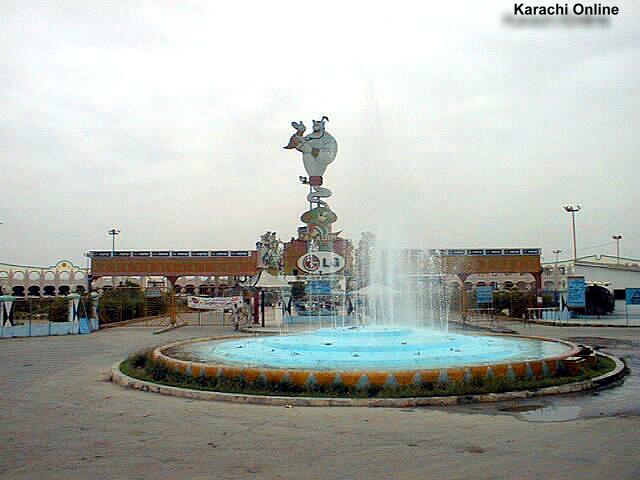 Aladin Water & Amusement Park Rashid Minhas Road, Karachi Ph : 92-21-8118476 - 87, 8120921 Fax : 92-21-8118479 Special Thanks for Mr. Abid Ali (Marketing Manager Aladin) for providing Information.